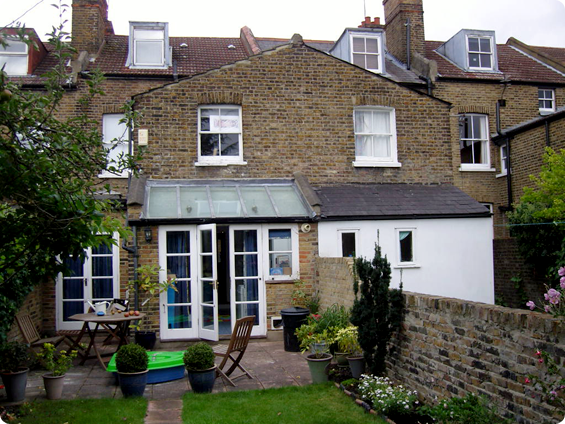 The owners of this house proposed an extension involving a slight increase in the floor space of the kitchen and the construction of a new wall to ground floor level at the rear of the property. It was planned that the rear wall would feature a long sliding door arrangement and the existing sloped glazing that comprises the roofing element to the rear of the ground floor would be replaced with modern, sloped glazing, with similar glazing to replace the flat roof and roof lights that currently sit above the southern portion of the existing kitchen – to the left below. The area of any windows or doors which, as a result of the extension works, no longer exist or are no longer exposed. In this case, the local Building Control Department were concerned about the amount of glazing in the proposed extension and wanted to be sure that the carbon emissions from the house and proposed extension above, would be no greater than the house and a notional extension with the area of openings corresponding to the guidelines listed under Part L1B. SAP calculations for the two scenarios were undertaken using NHER software, following a site visit to measure up and understand the existing construction of the property. In this instance the proposed extension just complied. Had it not, then options would have been modelled using the software to examine the possibilities for improved U-values to the proposed extension and/or additional energy efficient upgrades to the existing house. This type of work is highly bespoke and staff at The Blewburton Partnership are well versed in the intricate requirements and challenges that this can present.